7.97 points at 58 votes (rank 89). Blue Max is set in World War I. 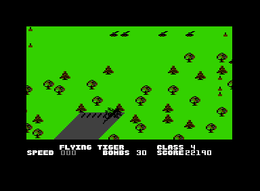 The player is the pilot of a double-decker and can destroy enemy planes, tanks, and flak. It can also destroy buildings, bridges, or ships. The player can attack with machine gun fire (having unlimited ammo), or with bombs of which you can only carry maximum 30. The plane can be moved up, down, and sideways. Diagonal moves allow flying forwards and backwards to a limited degree. Bombs are dropped by moving the joystick forwards with fire button pressed. The game starts with refueling the plane's tank at a military airport. Pressing the fire button starts the plane. Don't leave the runway before reaching 100 mph. 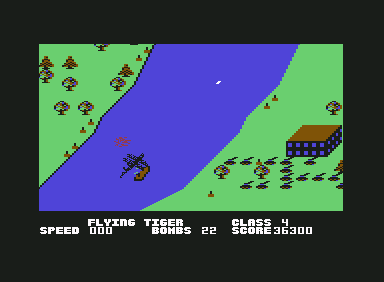 After starting successfully, your first mission is to bomb enemy objects along a river. You will be signaled in time when the next airport is near where you can repair your plane, refuel its tank, and replace dropped bombs. In the options menu you can choose between three difficulty levels, and turn gravitation on (which makes the game even more difficult). You can also change the up/down joystick controls. Being coded by the same person, it's not surprising that Blue Max resembles the science fiction shooter Zaxxon, but Blue Max is set in a historical scenario. The most appealing features of the game are plain but nice graphics and a smooth diagonal scrolling. There is no ingame music, but FX an a catchy but simple title melody. If you fly close to the ground, you can shoot typical bombing targets such as tanks, ships and flak with your gun. If you are flying at the suitable altitude, the status bar at the bottom of the screen gets brown; if you are flying too low and risk collisions, the status bar will flash yellow. Enemy planes (announced with a "P" in the status bar) can be shot when you are flying at the same altitude; look at the arrow at the right bottom, if the your altitude is the same as your enemy's, the status bar will turn blue. A friendly airport is announced with an "L" in the status bar, to land bring the plane near the ground and then touch down on the runway as early as possible. Wait until your plane is refueled, bombs are filled up and possible damages are repaired. Press the fire button to speed up and when you have reach 100 km/h you can take off again. Attention: in higher levels you can be bombed by enemy planes while your plane is refueled on the ground. If there is wind driving the plane from the course, this is indicated with a "W". You can take four flak hits which cause damage to your gun (gets unreliable), the bombing equipment (gets unreliable), the control (delayed reaction) or the tank (fuel leakage). The fifth hit destroys the plane. You can avoid the enemy's flak by flying in a high altitude. You can dive under bridges. Time and again you encounter special targets, flashing planes, ships, cars or buildings, marked with an X. If you destroy a certain amount of those, you proceed to the next sector. The known river landscape is replaced by a road with different buildings to both sides and a city with skyscrapers. Don't try to destroy indestructible buildings there, focus on bombing the smaller government buildings which look as Greek temples in the middle of the screen. Don't worry if you missed one, you will try again and again until you hit three of these buildings. If you succeeded in doing so, you hear the title melody and the game starts anew. 1570: "Not really a pacifistic game which I spent hours and hours playing. A true golden oldie and for me one of the games that will always instantly come to my mind when dealing with the topic C64." Shakermaker303: "Very well done if not THE shooter for the C64. Will always cause high spirits. Brilliant controls and many gimmicks make it a classic to my mind. The FX are quite good, too, e. g. when hitting or being a hit. I can only recommend it to everyone who never played it. As a matter of course, I rate it the full 10 points." Robotron2084: "Blue Max is a Zaxxon clone which beats the C64 counterpart in EVERY respect. Thrilling Action and ear-blasting explosions (especially if you connect your stereo) combine to one of the best early shooters the bread box was allowed to experience. The fact that you cannot finish the game successfully after missing a certain amount of targets is a little downer. The game will switch to an infinite modus then which is not totally uncommon for shoot'em ups. That modus is good for boosting your highscore. To my mind, this game is really a terrific mega oldie which I rate 8 of 10 points. Well done, Synapse!" IrishAl: Just being isometric doesn't make a game a Zaxxon clone, that's a lazy comparison. If it's close to any other game it would be Scramble. The indexing of the game in Germany has expired by law after 25 years. In 2016, the assembler source code for the Atari version was provided by Bob Polin on the AtariAge forums. Atari disks with the source code to Blue Max. This page was last modified on 3 April 2019, at 14:44.